As a result of record breaking snowstorms it took me seven hours (instead of 3) and three broken Amtrak trains to get to New York for Fashion Week. Needless to say I was exhausted and down-spirited by the time I finally got there! The Heart Truth's Red Dress Collection was the first show I was able to make it to, but it made the whole crazy trip worthwhile! The Red Dress Collection show serves to bring about awareness that heart disease is the #1 killer among women. 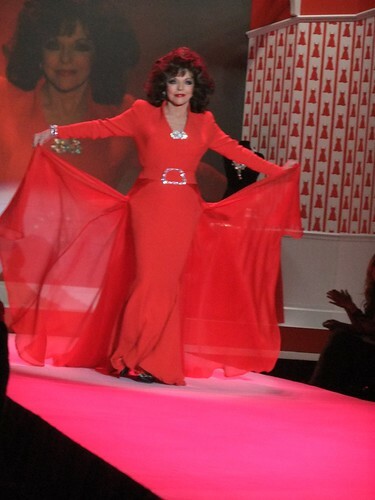 Seventeen celebrities strutted their stuff down the runway, wearing vivid red dresses by seventeen different designers. The show was all about having a good time with many of the celebrities hamming it up and enjoying their runway walk to the max. Kristin Chenoweth in Daniel Swarovski, Jordin Sparks in Badgley Mischka , Felicity Huffman in Oscar de la Renta , Mamie Gummer in Michael Kors, Raven–Symoné in Tadashi Shoji, Bethenny Frankel in Isabella Oliver, Regina King in Tracy Reese, Valerie Harper in Pamela Rolland, Dara Torres in Rachel Roy, Joan Collins in Stephane Rolland, Kim Kardashian in Notte by Marchesa, Pauley Perrette in Rebecca Taylor, Kimora Lee in Kouture by Kimora Lee, Estelle in Zac Posen, Robin Roberts in J. Crew Collection, Elisabeth Hasselbeck in Donna Karan, Heidi Klum in John Galliano. Some of the dresses are up for auction at www.clothesoffourback.org through March 5th.